Time is one of the most precious and limited commodities there is. That’s why we need calm technology that does not try to hook users on the service, but is designed around the quality of the user’s time. The realization of distraction-free tech requires designers, users and service providers to change their culture. The business rationale and methods for such change are still missing, though. One of the most challenging goals of distraction-free technology is to distinguish between trying to win the user’s attention and making a profit. Annoyingly often, there’s a direct connection between the two: when a company gets a user hooked on tech, its profits grow. Even though I wrote my thesis on distraction-free technology and feel strongly about the subject, I still tend to get caught in an endless timeline-browsing loop whenever I open Facebook. What’s particularly alarming is that such tendencies are the result of deliberate design, which is already evident in many services. ”Attention overload is now the single biggest bottleneck most technologies face, and the strongest argument for making technology ‘calm’”, says anthropologist and UX designer Amber Case. Data is the currency of the new world, justifiably exploited by companies and their consultants. The achievement of product targets can be verified with user data, and designers can use it for supporting their work. Service providers should be more aware of their responsibility, however. Users give their data to services with the assumption that they will be used to improve their lives and user experiences, but business objectives are not always aligned with user needs. The fundamental question is, are technology and human needs converging on a common goal? If the success of a product is based on manipulating or addicting the user, a new direction is needed in design. How could we design products that can be opened, used and closed with peace of mind? For the first time, the recent OS updates published by Google and Apple now identify detrimental phenomena caused by their own devices, such as problems with the use of time. When you fiddle with your devices, time flies by without noticing. But device manufacturers are just the ineffective gate-keepers of products designed to compete for the user’s attention at any cost. The combined effect of addictive digital services and shorter attention spans can make technology have a negative impact on our well-being. But the heart of the problem is hard to reach. Many accepted design paradigms and metrics rely on hooking users and achieving short-term profits, without regard for the product’s effects on well-being. How should designers look at distraction-free technology as part of the bigger picture? And, ultimately, who is responsible for it? Creating a distraction-free product may drive designers to distraction, but creating something great always takes effort. You could start by looking at whether users can manage notifications, understand the disclosure principles of their data or close the app without feeling like they are missing out. It’s also important to keep in mind that designers need concrete guidelines, expertise and support from their colleagues and managers before they can promote calm technology in their work. When I started researching my thesis on distraction-free technology, sources on ethical and calm design were scarce. I nevertheless felt that, in the future, the topic would be a major talking point among consumers and designers both. Thankfully, this has already materialized in the past year. In the end, companies and legislators will decide what kinds of applications and online services we open on our terminal devices and what criteria they need to stand up to. In 1971, Viktor Papanek wrote on the role of the state as the guardian of welfare and its power to regulate products through legislation. The same thinking applies to distraction-free technology: when it receives enough backing and its importance is realized, it can be legislated. The Accessibility Directive passed by the European Parliament is a good example of this. Sytyke ry chose Jesse Ukkonen’s thesis on calm design as the most influential thesis of 2018. Versions of this story have been published in Sytyke ry’s magazine and TIVIA. 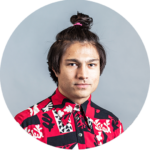 Jesse Ukkonen is Qvik’s Product Designer who is enthusiastic about calm design and creating truly useful products. On his free time, he plays roller derby, meditates, and is always making plans for his next cross stitch work.